*Va i Ve Piano Duo (Seferinova and Bojkova) rec. Studio S2, Polish Radio, Warsaw, 19-20 July 2013. Though once a musician as renowned as his elder brother, violinist Henryk, Józef Wieniawski's star waned after his death. By contrast Henryk's works continue to be performed by virtuosos to this day. Yet New Grove describes him as "far more versatile [a composer] than his brother". The present recording is Acte Préalable's second disc to date of piano works, billed, like the first (AP 0184), as 'world premieres'. It is another welcome step towards re-illumination of the considerable talent of a pianist-composer thought to have been the first to play in public the complete Etudes of Chopin and who once shared the concert stage with Liszt. One work that it is easy to imagine Wieniawski performing with that illustrious company is the bill-heading and substantial Fantaisie for two pianos, a "neo-Romantic piece par excellence", according to the booklet notes (but why 'neo-'?). 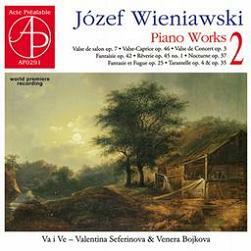 Lively, entertaining and of course virtuosic – though not uncouthly so - it offers listeners an immediate all-in-one assessment of the strengths of the disc's recitalists, the England-based Bulgarian pianists Valentina Seferinova and Venera Bojkova, performing on this track and the last as the Va i Ve Duo. The remaining items of their programme are considerably shorter. No composition or publication dates are provided for any of these works, but it may be that they are not known – certainly New Grove offers no enlightenment. Whilst some pieces are, frankly, more pleasant than interesting – the Valse de Concert op.3, Valse de Salon op.7 and Reverie op.45/1 fall easily into this category – the rest qualify as elegant occasional works from the Chopin lineage. Besides the op.42 duo, the Nocturne op.37 and the Fantasy and Fugue op.25 are stand-out pieces, both occupying twilit emotional spaces, with the two Tarantellas catering for sunnier unbuttoning. Seferinova and Bojkova, democratically alternating pieces, make the most of even the slighter scores, tackling them all with flair and communicating a strong sense of fun. Acte Préalable's recording is generally good – the microphones could have done with being just a little closer for more clarity. Both the Valse-Caprice and the Tarantelle op.4 are minimally marred by a light knocking sound from the piano action at certain points. Maryla Renat's notes are highly informative: a good dense paragraph for each piece of music, not to mention a sizeable introductory biography of the composer. The English translation is impressively idiomatic. In his preface to this recording, label owner Jan Jarnicki writes: "I always find it astonishing how my fellow countrymen have so quickly forgotten Jósef Wieniawski and his wonderful musical compositions". Yet he should not really be surprised, given that matters are, in truth, far worse. The only thing standing in the way of almost complete cultural amnesia – obliteration, indeed – with regard not only to Wieniawski, but to almost all his fellow composers, are rare figures like Jarnicki. Their dedication to art music in a global society populated in some respects by a 21st-century equivalent of Marcuse's 'One-Dimensional Man' – with its 'terror-free' pop culture totalitarianism - is what most realists would surely consider a lost cause. On a more upbeat note: perhaps one day Jarnicki will also cast a beneficent eye over the music of an even more neglected Wieniawski – Józef and Henryk's cousin, Adam (1879-1950). To hear a work for violin and piano from all three Wieniawskis side by side would be fascinating — another Polish label, DUX, got two thirds of the way there a few years ago – see review — as would Józef's string quartet next to the pair by Adam.